This nocturnal, tree-dwelling relative of the racoon and coatimundi is known for hanging upside down while feeding, using the tail and hind legs for support. 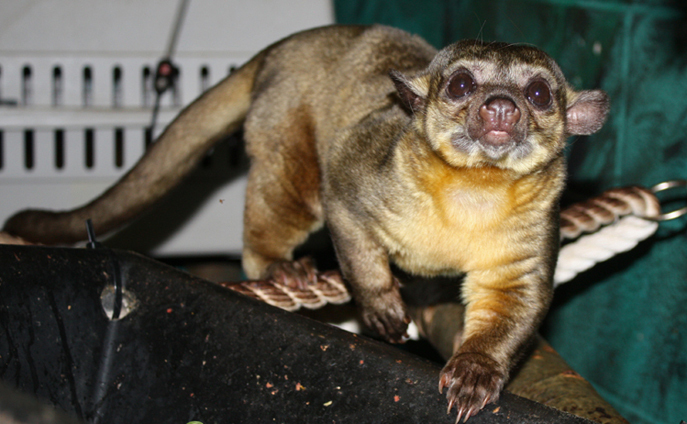 When climbing, kinkajous are aided by their long prehensile tail, fully reversible hind feet and extreme spinal flexibility. They are usually found alone but will loosely associate in groups consisting of a dominant male, a subordinate male, a female and her offspring. While collecting nectar with their long tongues, kinkajous bury their faces into the flower and pollen sticks to their fur, which then pollinates other flowers.